Southeast of Phoenix Arizona, in the town of Gilbert, discover The Reserves at Val Vista, an exclusive gated enclave with gorgeous water features, tree-lined streets, and stunning homes. Here you’ll find large homesites—a minimum of one-quarter acre each—with at least twenty feet between each new home. Beautifully maintained common areas include a bocce ball court, hopscotch, giant chess, and an outdoor fireplace. Students in this community attend schools in the Chandler Unified School District. Shopping, dining, and golf are minutes away, and close proximity to the 202 makes all of the Phoenix Metro easy accessible. 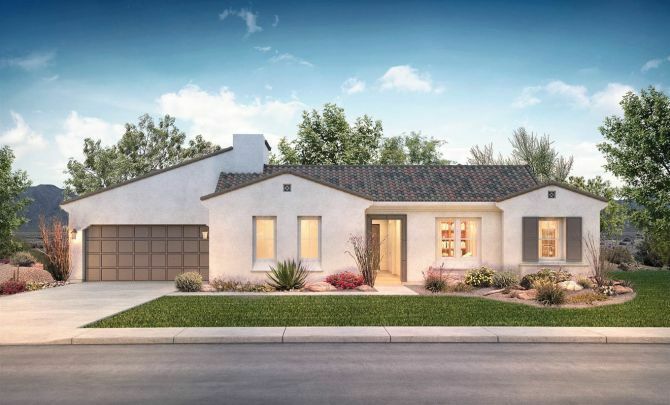 The new homes of The Reserves at Val Vista range from ~3,200 to ~3,900 square feet, with 4-car garages providing plenty of room for your cars, toys, and gear. Distinctive floorplans feature gourmet kitchens, large bedrooms, functional outdoor rooms, and loads of options to personalize your space.